On this grid are two triangles made up of several different colored pieces. The first triangle is complete, however the second triangle which appears to consist of all the same pieces as the first has a square missing. Where has it gone ? Try counting the blocks that make up each piece - are they the same ? the bottom triangle is larger than the top triangle. each triangle are not triangles they both have 4 corners. look closely at each overall triangle/straight lines. it look like an illusion but if you draw a line between sharp angles o trianghle you will see that: the longest line from triangle in not a line is made from two line. Is more simple to make all shape from big paper and will see a little diference af angle. sorry about my englesh but I hope you manage the ideea. they switched triangles... which might of allowed the orange block to shift, then create an illusion... like that game "jelly blocks" (search it on google, or addicinting games)! Its easy it all depends on how you place the triagles. the diamater changes due to the fact some triangles perimeter may not all fit in a certain place. They are not triangles, just measure the angles if you don't believe me. They are concave quadrilaterals or arrowheads if you like. its easy you just need to arrange the triangles differently DUH!!!!!! No one can say i'm wrong on this one. The reason is because of the way the colored shapes are aranged. I counted every colored square, and compared them. If you do the same, then you will see. Trust me. I am right on this one. You have to arrange the colors differently then it will all fit together and the whole thing will be perfect!! These are not triangles. They are quadrilaterals. If you look closely you will see that there is a slight angle in the hypotenuses of the "triangles" -- that is, there are actually four sides to the figure: the two obvious ones, and two for the long side. I think that that was what the foreign person was trying to say, just in clearer words. I just cannot explain this, it is scaring. The small triangle is 5x2 giving it a ratio of 2.5:1, the larger "red" triangle is 8x3 giving it a ratio of 2.7:1. This means the hypotenuse of the two triangles are different (about 1* or so), giving the over all shape four sides. If one were to mirror the triangle (without missing square) along its hypotenuse, one would find a gap in the center along the hypotenuse with the same area as the missing square. yup.. true.. both formed pieces are not triangles. They are quadrilaterals. The explanation for this is that the hypotenuses of both the red and the blue triangles are bent. There is no such possibility as a 13 x 5 triangle. Notice where the red and blue triangles meet that in the other one it is lower. the red at first image is one square larger than the red in the second image ... duh! Easy, the placement. It's like a math equation that isn't in the commutative property. Sigh. So simple. On the hypotenuse (of the perfect TRIANGLES - who can't see that these are triangles?!) - just shift the 2 colored triangles. The top piece is smaller than the bottom piece. So, when it's put in the position of the bottom piece -- and the middle piece re-inserted -- it shifts the position of that middle piece, creating that "empty" square. From the other perspective; the bigger triangle at the top (in the 2nd arrangement) also shifts the middle shape a bit further than it originally was, and hence, the space was created. Shapes in the 1st and 2nd figures all have the SAME AREA. However, the positioning/arrangement of the 2 triangular shapes cause the middle shape to be placed in a position that "causes" an empty space to be created. What skittlezrock161 is also perfect. It reflects the properties of a commutative equation. That is all folks!!! Legendary Brilliance!! the triangles from the second image are not identical to those from the first. 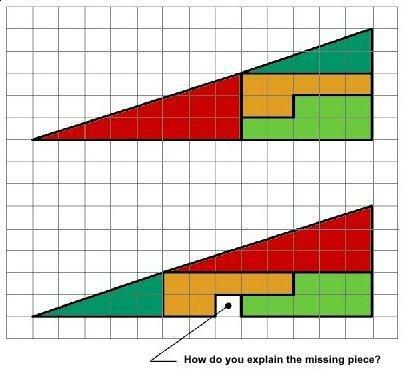 There is a small margin along the diagonal line of the big triangle, the amount of the margin equals the missing place. PS: look the the grid in comparison to the two triangles you will notice that the diagonal of the second one is slightly levetid than the first one. Place a ruler along the long side (hypotenuse) of the top triangle. The line bows inward toward the centre of the triangle, Now do the same along the long side of the bottom triangle. The line bows outward away from the centre of the triangle. The difference in space between the inward and outward bows equals the space of one missing block. it doesn't have a missing square it just has been placed differently so it looks like there is one missing cute them out and place them on top of each other cutting them out from what the top one looks like and arrange one to look like the bottom one using the same amount of squares and it looks like this image. the missing one is added to the red blooks. It has one extra. It is all about the steepness of the slopes of the 2 small triangles. Count the squares to calculate the steepness of their respective slopes. Slope of the smaller Green triangle = 2/5 (moving up 2 squares for every 5). It is 3/8 for the slope of the Red triangle. Simply put it, they are not equal. Thus, the presumption that the top and bottom (with the additional white square) big "triangles" have the same total areas is the biggest trick of this optical illusion. I'd say Davy has it right. The hypotenuse on the top is bowed inward, on the bottom it is bowed outward (compare where the hypotenuse crosses the grid lines, you can see they are slightly off - to account for one extra square out of 32 (3% by volume), you don't need to cheat by much), therefor the bottom one is slightly bigger, accounting for the missing piece when the components are rearranged. I thought they could do the same simply by making the grid lines 3% narrower, no need to resort to bending lines.